Indiana State University's Community Semester will focus on sustainability this week. The Indiana State Institute for Community Sustainability and its partner Our Green Valley Alliance for Sustainability invites the Terre Haute community to attend a discussion about the Sustainability Plan for the Wabash Valley on Feb. 12, from 6 - 8 p.m. in the Landsbuam Center Classroom located at 1422 North 6 ½ Street, just south of the Union Hospital Family Practice Center. This event seeks to help improve the quality of life in the Terre Haute community by focusing on livable communities, energy consumption and waste stream management. The sustainability plan looks at what people think of the quality of life here in the Wabash Valley, said Jim Speer, associate professor of earth and environmental systems and executive director of the Institute for Community Sustainability. The institute and alliance sent out surveys requesting information about what people think of the quality of life in the Wabash Valley. The survey focuses on areas such as bikable, walkable and livable communities, stewardship of the local environment, energy consumption, waste stream management, local foods and social justice. So far they have received more than 480 responses. "People should attend this event so we can get more feedback from the community," said Speer. During the three-year planning process, the group plans to submit a report to the city government to try to obtain funding. "We would like to get a grant to study the water here," said Speer. 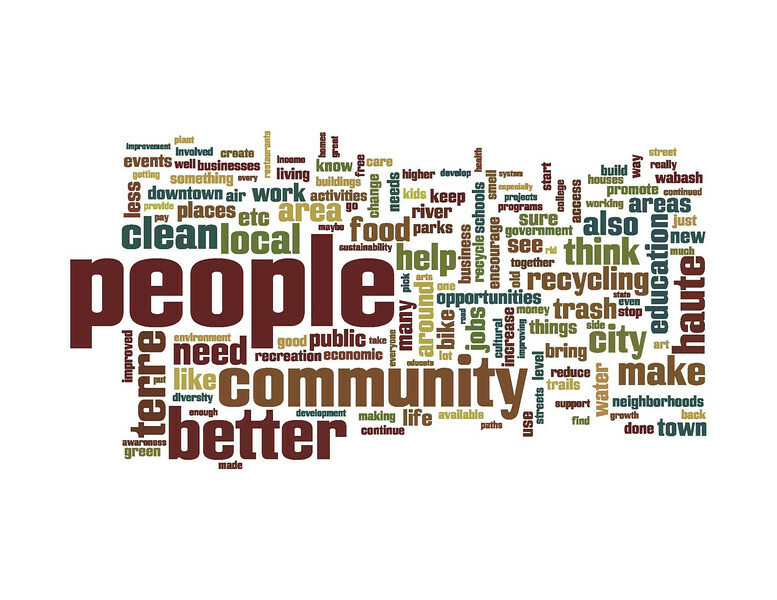 Graphic: http://isuphoto.smugmug.com/photos/i-rq9ggCD/0/L/i-rq9ggCD-L.jpgThis wordle shows the words people use to answer the question from the Vigo County Sustainability Survey "What are the main factors that affect your impression of the Quality of Life in Vigo County?" The people, community, education, smell, air and water quality, food and health care are some of the main factors that people think about when they think about their quality of life. The Indiana State Institute for Community Sustainability and its partner Our Green Valley Alliance for Sustainability invites the Terre Haute community to attend a discussion about the Sustainability Plan for the Wabash Valley on Feb. 12, from 6 - 8 p.m.